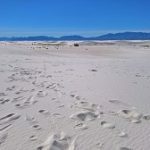 The word desert does not usually conjure up the word enchantment, but there is one section of desert that can be considered akin to enjoying a beach all to yourself on a bright, sunny day. The temperature feels perfect—in the upper sixties with zero humidity and not a cloud in the sky. You lie on one of the numerous sand dunes while feeling the gentle breeze. This momentary getaway is so refreshing, so relaxing, you do not want to leave. One by one we boarded the old ranch van. Our tour guide, Karen, drove us to a restricted part of the ranch that includes Georgia O’Keeffe’s home. We walked in the arroyos and horse trails, being careful not to step off the trails and damage any of the fragile flora or fauna. The longtime drought had taken its toll on the landscape. Karen pointed out the tiny plants that were struggling to survive the hot, arid climate of New Mexico.